2. 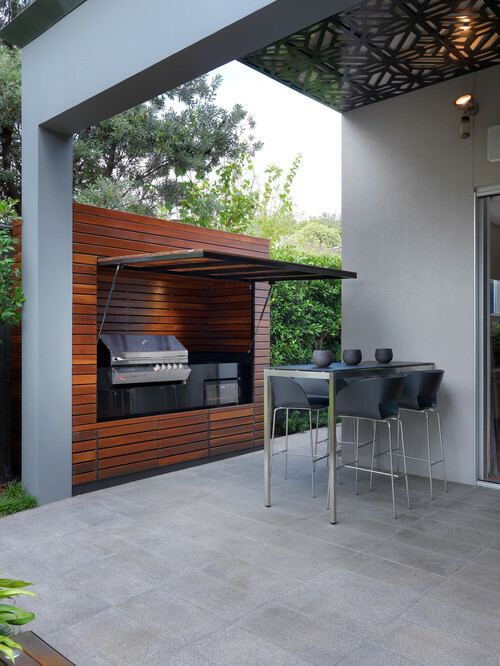 Protected Against the Elements: This ultra-simple outdoor kitchen relies on your furniture to make an impression. 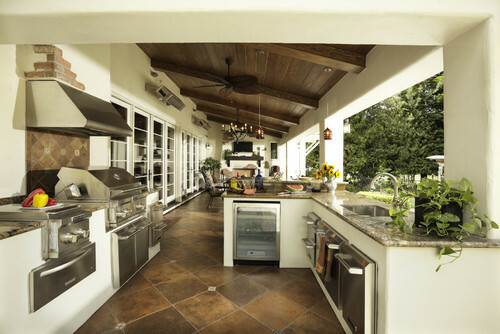 The stone tile flooring can stand up to rain and the clever closing kitchen compartment can be shut when not in use—protecting your kitchen components from rain and the harsh Florida sun. 3. 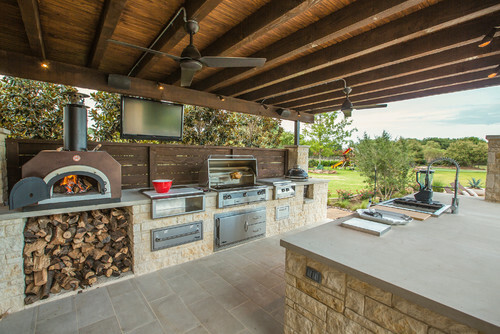 Have Your Own Gourmet Pizza Place: Here’s a gourmet kitchen that offers just about anything you would want, including a wood-burning pizza oven, a gas grill, a side burner, and egg smoker, a sink, a refrigerator, a trash chute, and a serving station. This homeowner even opted to install a flat-screen television in the kitchen. You may never cook in your indoor kitchen again! 4. A U-Shaped Cabana Kitchen: This kitchen is built in the U-shape design that is so popular in many indoor kitchens. Set on a concrete slab, the kitchen affords plenty of space for the cook (and all of his or her helpers!) to grill and clean up. There’s an ample staging area to the right of the grill so that the cook isn’t struggling to find space for food preparation. 5. Tuscan Style Kitchen: If you happen to have a Tuscan-style Naples home, you might want to extend that look to your outdoor kitchen. The woodwork, countertops and even the tile flooring create a cozy and comfortable atmosphere. 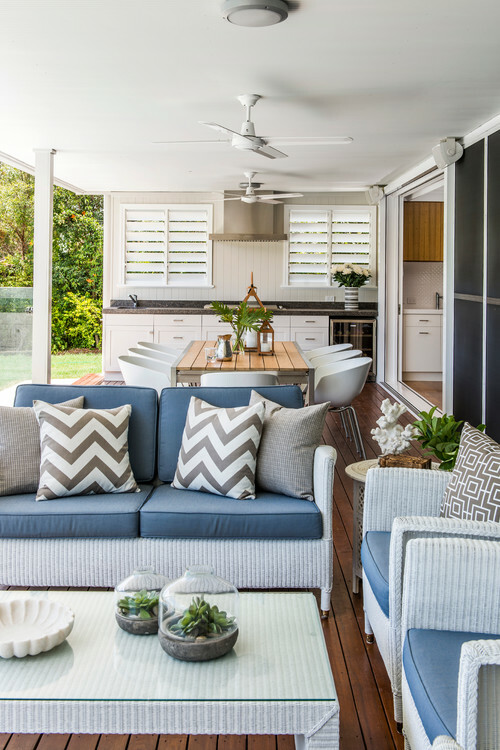 With a seating area adjacent to the kitchen, it's like having a Great Room concept outside. You can include whatever appliances you need. Include ceiling fans to keep the air moving on warm evenings, and use built-in space heaters in case you want to stay outside on those rare cool evenings. 6. 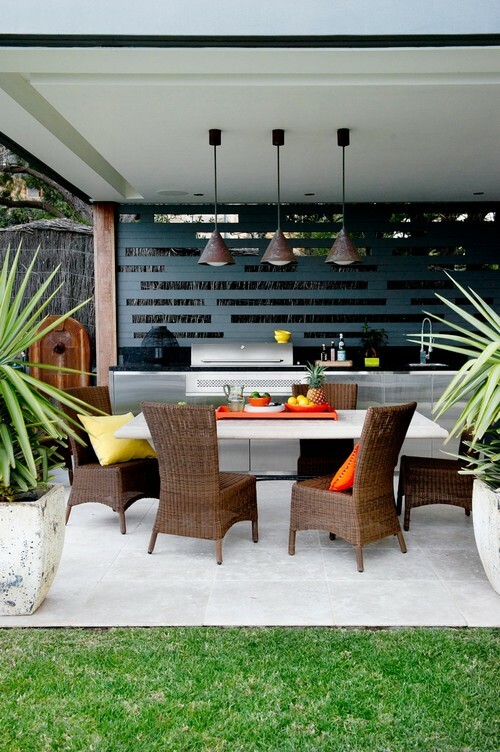 Light and Bright Traditional: Your outdoor kitchen doesn’t have to be huge. This light and bright traditional-style kitchen offers plenty of space (including a nice seating area next to the dining table. It’s conveniently located right next to the indoor kitchen in case you need to pop inside for extra ingredients or utensils. The slat wood flooring and louvered shutters create a comfortable casual look. What if you don’t see exactly what you’re looking for here? That’s not a problem. 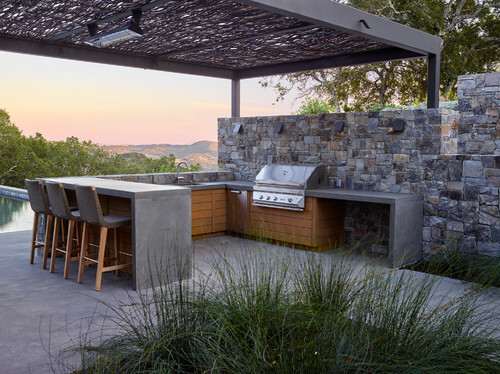 Our design team would be delighted to work with you to create the perfect outdoor kitchen to meet your needs—and to fit in flawlessly with your existing home design.